Four words to start off this report sound no better than “7 days of wind”. Right out of the blocks, kiters were powered on 12m-15m kites and it only got windier throughout the week. By mid week, riders were using 9m-12m kites and the 8m’s even came out for a session or two. The new kites on the water included 2009 Naish Helix and Cult, Best Nemesis HP, Liquid Force Havoc and Slingshot Rev 2. (We are expecting to unveil the soon to be released Slingshot RPM on week #2). Many of the participants were able to demo the new kites and some new ’09 boards as well from Jimmy Lewis, Naish, and Liquid Force. The new Naish “Fish” waveboards were very popular with their quad fin design and 5’2 x 17.5 and 5’7 x 19.25 sizes. These boards have wider noses and tails, producing a straighter outline and smoother edging across the wind. The new JL Supermodels in 135cm and 140cm were also very popular, as were the new 2009 Naish Twin Tips. The tradewinds were mostly East in direction with a few ESE days and we did a have a good NW groundswell on 1/11 as predicted. The groundswell lasted for 3 days adding some excellent wavekiting to the already unbelievable flatwater riding. With winds blowing day and night, it was pretty easy to rack up 3 solid sessions a day, plus still have time for the “extra curricular activities” that fill trips like these! There’s only one thing better than 7 straight days of wind and that is the ability to do long downwinders, over crystal clear blue water, powered up on medium sized kites ! We had two of these downwinders with over 5 miles of downwind riding each, as well as many others in the 2 mile range. Kites for all of these runs ran in the 9m to 14m range. The longer downwinders required a surfari cab ride upwind to our launch point and then endless riding downwind over some of the prettiest water this world has to offer. The peak of the downwinders saw 15-20 kites raging downwind, everyone with ear to ear grins. These runs were some of the best sessions of the trip! After a long day on the water, nothing beats a great hour of boat drinks and appetizers with new friends as the sun goes down. On Week #1 we had a rotating Happy Hour schedule that saw each boat host a Happy Hour party throughout the week. This was a great way to get out each evening and socialize with the rest of the group, as well as a way for each boat to spice up the week with their own unique party. The 65ft Moorings Catamaran “Bonaventura” pulled out all the stops for their Happy Hour with endless platters of sushi, pesto mussels, caviar toasts, cheese and crackers, nuts, veggie dips, along with every imaginable cocktail and beer served from their fully stocked bar. The Happy Hours were a great way to wind down every day with friends! Well the rumors are true. Jimmy Buffett joined up with us for 4 days during Week #1, as he was in the BVIs for a week with his friends celebrating his manager’s Bachelor Party. Jimmy lives life like his songs that motivate us all, surfing twice a day and enjoying the time in between with friends. He had a great crew with him, all of them surfers, standup paddlers and great people to hang out with. The Buffett experience peaked on his last day when he played a private show for us at a local beach bar. Many of Jimmy’s songs are inspired by the BVI lifestyle and playing for people who were immersed in “the life” seemed to motivate Jimmy to put on a really great show as everyone was on their feet the entire time. Look for a great slideshow from this show when we return to Cape Hatteras at the end of this month. Special thanks to Jimmy, Glen, Mike, Dave, DJ and Tyler for including us in their week and for putting on the show on your last night. Congrats to Mike Ramos for making it thru his bachelor party week with some great waves! We had a great fleet of yachts from The Moorings based out of Road Town in Tortolla. This year saw us on the water with all catamarans designs ranging from 46 feet up to 65 feet. The cats offer a ton of extra room both above and below decks for gear and people. All of the boats in our fleet were under 2 years old and in immaculate condition. This year, we are on a Moorings 474 Powercat, a first for us. Our boat was so new they hadn’t even had time to name it yet! The 474 Powercat offered great space, extremely easy kite launching and landing from the deck (no mast and rigging to get in the way) and numerous hydraulic storage compartments to organize all of our gear. In fact, Jason and Sammy only launched from land once during the entire trip, the rest were off the deck of the 474 Powercat. For those that prefer sailing, this same hull configuration can be found in the Moorings 4600 Sailing Cat. The monohulls are more fun to sail, but it seems the utility benefits of the cats have definitely taken over. REAL BVI Week #2 runs January 18 – 25, 2009. For this trip we are reversing our normal travel itinerary and visiting several new spots for kiteboarding, surfing and standup paddleboarding. We have another great group of people down for the trip and as we write this report they are arriving on Tortolla as we ready the Moorings Base for the REAL BVI Opening Party. Some of the early arrivers told us it is freezing cold at home and how glad they are that they booked the trip. “Recession or not, they are not skimping on taking sessions!” We’re looking forward to another great week of epic sessions, sunsets and boat drinks! 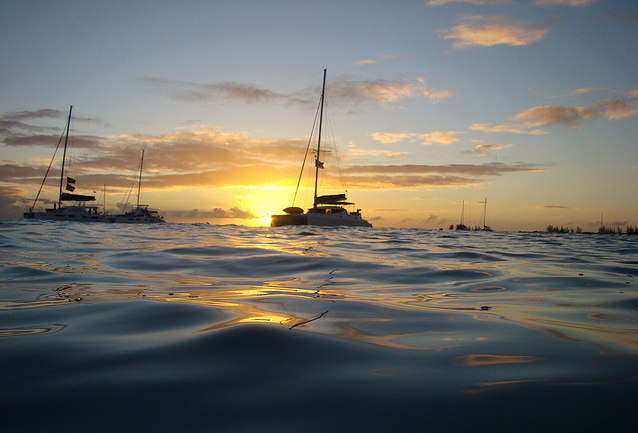 Special THANKS to all guests and crew that participated in REAL BVI 2009 Week #1!